The studio is located 514 Central Avenue, next to FD Cheesecake Lady. IS PARKING FOR THE STUDIO FREE AND EASY? Yes. There is parking in front of Studio and just around the corner. CAN I DO CURLY & STRAIGHT HAIR OR SUMMER & FALL? Yes. The Split Session created for just that. We reschedule for three weather reasons: Too wet (rain), too hot (heat advisory), too windy (15-25 mph & above). Yes. We are old school like that. WILL I GET IMAGES FOR SOCIAL MEDIA? HOW MUCH DO PEOPLE NORMALLY SPEND? Starting budget would be around $700. That said, most people spend between $1500 and $2500. DO YOU SELL DIGITAL IMAGES? We sure do! 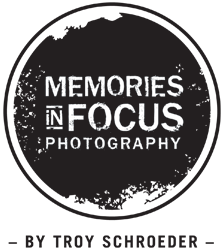 Memories in Focus is a full service portrait studio - which means our specialty is creating beautiful portrait art and products for your home. The type of products that will be around for your kids and their kids (aka - forever!). In addition, we recognize the desire for digital images so full resolution, retouched images with print release are available. WILL YOU HELP ME HANG MY WALL ART? HOW LONG IS ORDER TURN-AROUND? Good things take time. Our typical order turn-around is 4 to 6 weeks. Some products, like albums or specialty frame projects, may take more time. DO YOU ACCEPT DEBIT & CREDIT CARDS? WHAT ABOUT A PHOTO FOR MY YEARBOOK? Your session fee includes a yearbook photo. You'll select your photo at the order appointment and we'll email it to your school. Please verify with them that they received it.